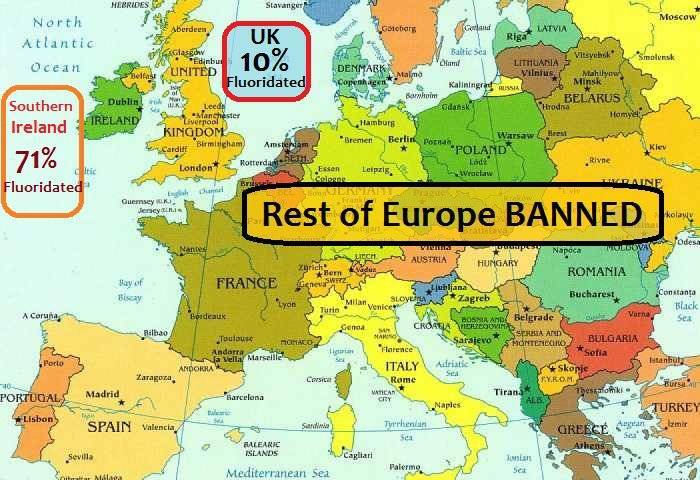 In Prestigious Medical Journal: Why Is It Still In Our Water? 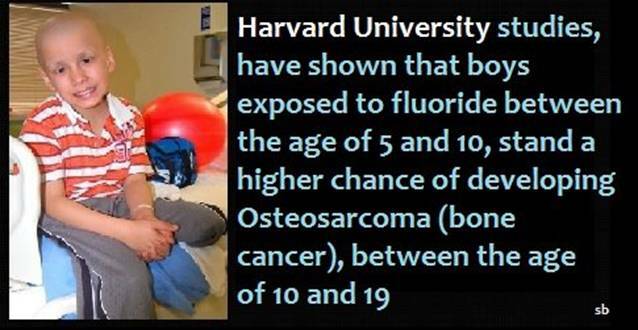 "In point of fact, fluoride causes more human cancer deaths than any other chemical. When you have power you don't have to tell the truth. That's a rule that's been working in this world for generations. There are a great many people who don't tell the truth when they are in power in administrative positions. 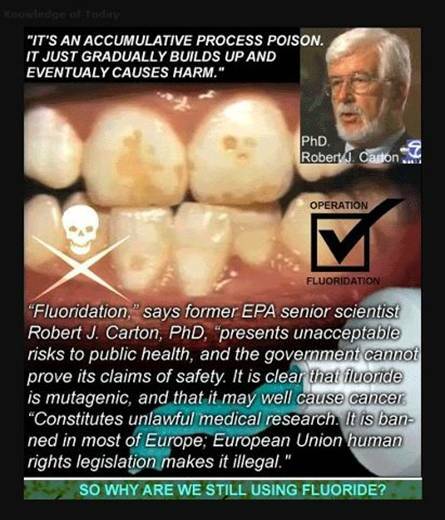 Fluoride amounts to public murder on a grand scale. It is some of the most conclusive scientific and biological evidence that I have come across in my 50 years in the field of cancer research." 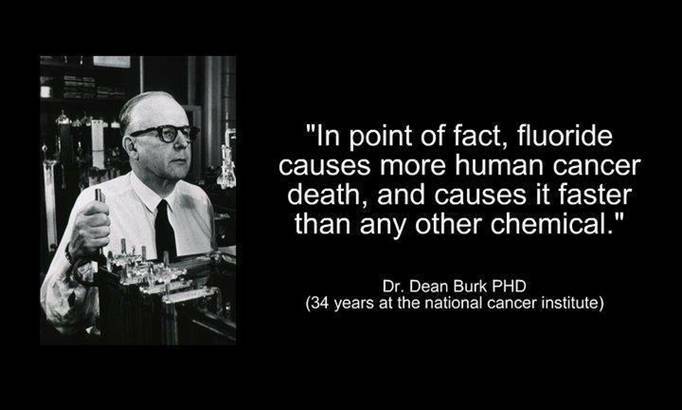 ~ Dr. Dean Burk, Biochemist, Founder of Biotin, and Former Chief Chemist at the National Cancer Institute of Health. 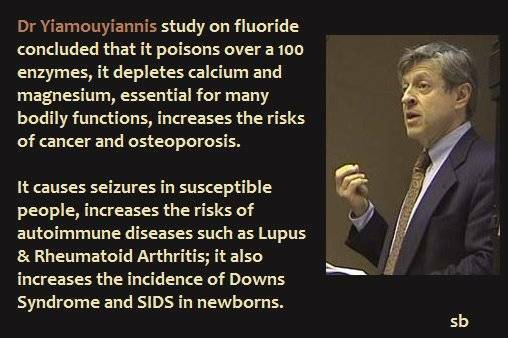 with a brief overview on fluoride. 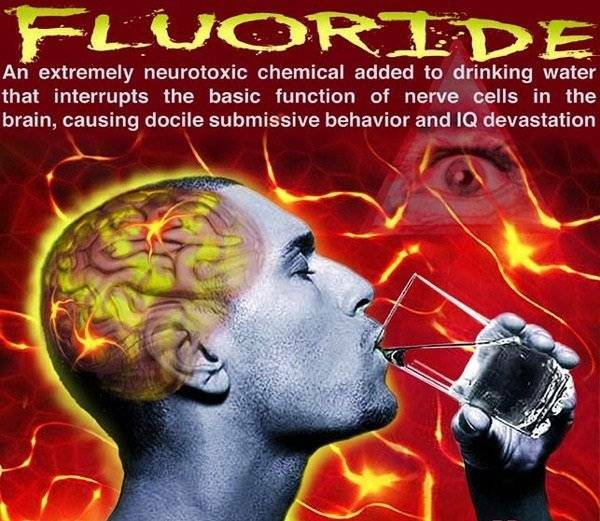 Description: /span> Fluorides are a key ingredient of Prozac and many other psychiatric drugs. 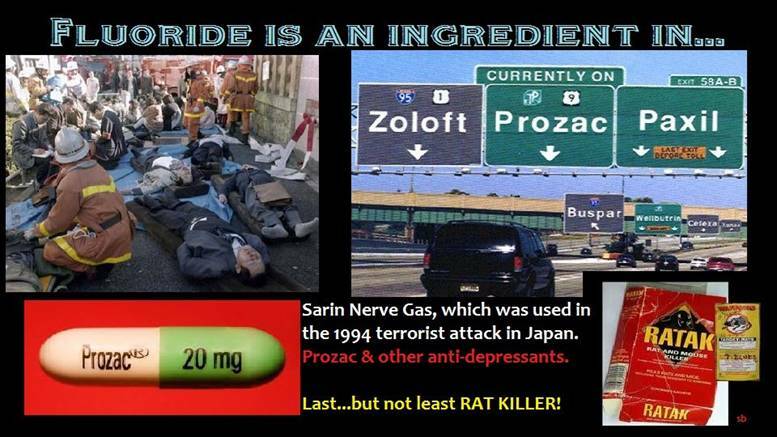 Sarin Nerve Gas that terrorists released on a crowded Japanese subway train! 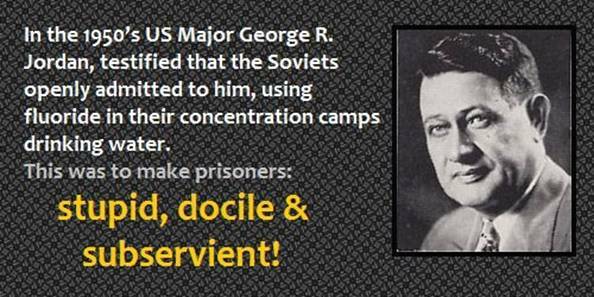 anesthetic, hypnotic and psychiatric drugs and NERVE GAS! 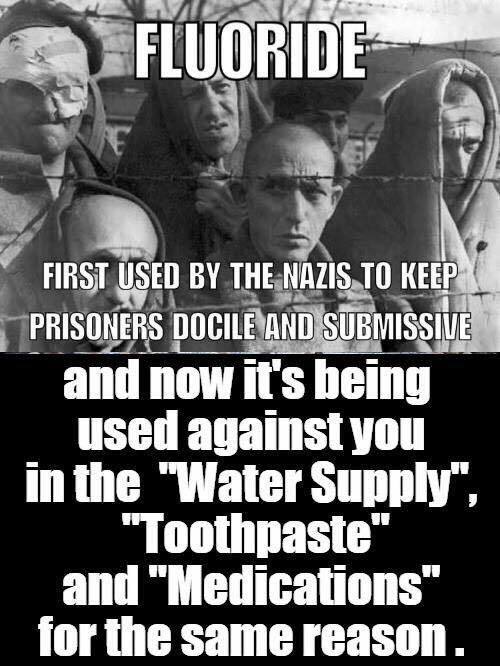 It is added to toothpastes and drinking water. Follow the money... who profits? Wall Street or Main Street America? The addition of chlorine to our drinking water began in the late 1800s and by 1904 was the standard in water treatment, and for the most part remains so today. We don't use chlorine because it's the safest or even the most effective means of disinfection, we use it because it is the cheapest. In spite of all our technological advances, we essentially still pour bleach in our water before we drink it. The long term effects of chlorinated drinking water have just recently being recognized. According to the U.S. Council Of Environmental Quality, "Cancer risk among people drinking chlorinated water is 93% higher than among those whose water does not contain chlorine." Dr. Joseph Price wrote a highly controversial book in the late sixties titled Coronaries/Cholesterol/Chlorine and concluded that, “Nothing can negate the incontrovertible fact, the basic cause of atherosclerosis and resulting entities such as heart attacks and stroke, is chlorine." Dr. Price later headed up a study using chickens as test subjects, where two groups of several hundred birds were observed throughout their span to maturity. One group was given water with chlorine and the other without. The group raised with chlorine, when autopsied, showed some level of heart or circulatory disease in every specimen, the group without had no incidence of disease. The group with chlorine under winter conditions, showed outward signs of poor circulation, shivering, drooped feathers and a reduced level of activity. The group without chlorine grew faster, larger and displayed vigorous health. This study was well received in the poultry industry and is still used as a reference today. As a result, most large poultry producers use dechlorinated water. It would be a common sense conclusion that if regular chlorinated tap water is not good enough for the chickens, then it probably is not good enough for us humans! There is a lot of well founded concern about chlorine. When chlorine is added to our water, it combines with other natural compounds to form Trihalomethanes (chlorination byproducts), or THMs. These chlorine byproducts trigger the production of free radicals in the body, causing cell damage, and are highly carcinogenic. "Although concentrations of these carcinogens (THMs) are low, it is precisely these low levels that cancer scientists believe are responsible for the majority of human cancers in the United States". The Environmental Defense Fund Simply stated chlorine is a pesticide, as defined by the U.S. EPA, who's sole purpose is to kill living organisms. When we consume water containing chlorine, it kills some part of us, destroying cells and tissue inside our body. Dr. Robert Carlson, a highly respected University of Minnesota researcher who's work is sponsored by the Federal Environmental Protection Agency, sums it up by claiming , "the chlorine problem is similar to that of air pollution", and adds that "chlorine is the greatest crippler and killer of modern times!" Breast cancer, which now effects one in every eight women in North America, has recently been linked to the accumulation of chlorine compounds in the breast tissue. A study carried out in Hartford Connecticut, the first of it's kind in North America, found that, "women with breast cancer have 50% to 60% higher levels of organochlorines (chlorination byproducts) in their breast tissue than women without breast cancer." One of the most shocking components to all of these studies is that up to 2/3s of our harmful exposure to chlorine is due to inhalation of steam and skin absorption while showering. A warm shower opens up the pores of the skin and allows for accelerated absorption of chlorine and other chemicals in water. The steam we inhale while showering can contain up to 50 times the level of chemicals than tap water due to the fact that chlorine and most other contaminants vaporize much faster and at a lower temperature than water. Inhalation is a much more harmful means of exposure since the chlorine gas (chloroform) we inhale goes directly into our blood stream. 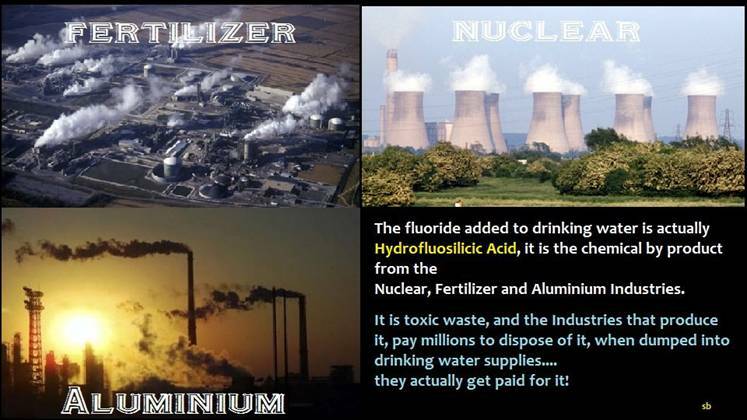 When we drink contaminated water the toxins are partially filtered out by our kidneys and digestive system. Chlorine vapors are known to be a strong irritant to the sensitive tissue and bronchial passages inside our lungs, it was used as a chemical weapon in World War II. The inhalation of chlorine is a suspected cause of asthma and bronchitis, especially in children... which has increased 300% in the last two decades. "Showering is suspected as the primary cause of elevated levels of chloroform in nearly every home because of chlorine in the water." Dr Lance Wallace, U.S. Environmental Protection Agency. The good news is that chlorine is one of the easiest substances to remove from our water. For that reason it logically should serve it's purpose of keeping our water free from harmful bacteria and water borne diseases right up to the time of consumption, where it should then be removed by quality home water filtration. 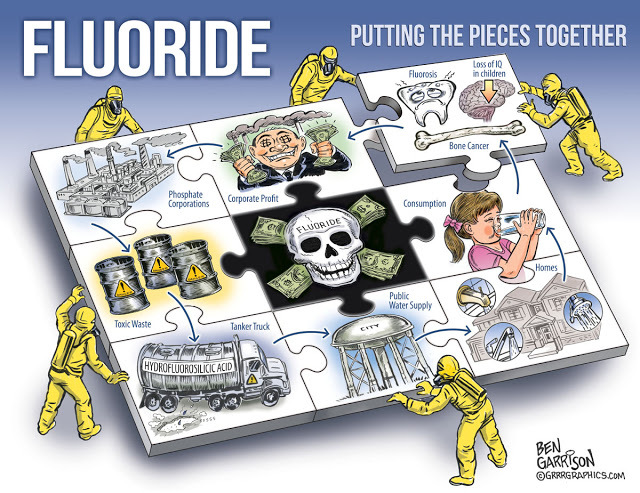 It is clear that chlorine represents a very real and serious threat to our health and should be removed in our homes, at the point of use, both from the water we drink and the water we shower in.